Gianfranco Zola was signed from Parma on the 15 November 1996. Zola was Chelsea’s first signing after the tragic death of Matthew Harding the month before. If only Harding could have seen Zola, he would have been amazed by how he has helped Chelsea and how much the little Sardinian is loved by the fans of the club. I remember seeing Zola play in Serie A and thinking how good he was. 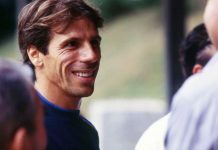 Zola, was influenced by a certain Diego Maradona when both played at Napoli, I’m certain there was nobody better that Zola could have learnt his skills from, Gianfranco has often said that the best player he’s played with has been Maradona. I’m certain that young players at Chelsea will say that the best player they’ve played with has been Gianfranco Zola. When Ruud Gullit signed Zola in 1996 Chelsea were starting a revolution. Who would have thought a few years before that we would have had players like Gullit, Vialli and now the much loved Zola? Gianfranco has been an inspiration to Chelsea Football Club, his skills are something to behold and his contribution has always been 100%. There have been a lot of foreign players that have come over to England and have been branded ‘mercenaries’ Franco is certainly NOT one of them. He loves Chelsea Football Club and has always expressed this fact. In 1997 Zola won the Player of the year award. This was his first full season in English football. It was wonderful to see such a player win the award and because he played for Chelsea it made it so much better. 1997 was a year that I’m sure every Chelsea fan will remember. This was the year that the club won their first major trophy in 26 years, the FA Cup. During that FA Cup run Zola contributed so much. In the Fourth round against Liverpool at Stamford Bridge Chelsea were 0-2 down at half time. In the second half contributions from Zola along with Mark Hughes and Gianluca Vialli helped Chelsea to win 4-2. An amazing game, it will always be remembered. Chelsea progressed to the semi-final where we played Wimbledon at Highbury. Zola scored a quite an amazing goal, he flicked it back, turned and scored in the right hand corner past Hans Seggers. The goal sent me into raptures amongst other Chelsea fans at Highbury that afternoon. Mark Hughes also contributed two goals to help Chelsea win 3-0. Zola had helped Chelsea to another final. After the 1994 FA Cup Final Chelsea played Middlesbrough. Zola played his part in the final by setting up Eddie Newton for Chelsea’s second goal. Roberto Di Matteo scored the first after 46 seconds and Chelsea had won their first piece of major silverware in 27 years. 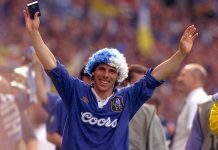 Zola said recently in an interview that the atmosphere at Wembley that day was magnificent and winning the cup meant so much to him. It meant so much to Chelsea fans too. Gianfranco Zola has always been monumental in helping the team. A goal that I remember from the little man came in 1998 when we played Vicenza in the European Cup Winners Cup semi final at Stamford Bridge. Chelsea had been 1-0 down from the first leg in Italy and we had also been 1-0 down at Stamford Bridge. In the second half a magnificent cross from Gianluca Vialli, was headed into the back of the net by Franco. To see the little man wheel away after scoring will forever live in my memory. 1998 saw Chelsea reach the final of the ECWC against VfB Stuttgart of Germany. Franco had been injured previously to the final and had made a fantastic comeback in time for the final in Stockholm. That night however Vialli had left Franco on the subs bench much to the little Sardinian’s dismay. After about 71 minutes with the score still 0-0 Tore Andre Flo was replaced by Franco, a through pass from Dennis Wise found Zola almost straight away and with a bullet shot Franco scored. It was quite amazing, a night to be remembered in the history of Chelsea Football Club and a night that I’ll forever love Gianfranco Zola for. To see the ecstasy on Zola’s face was incredible, it was a time that I can only ever thank Franco for because it will live forever in my mind and I’m sure every other Chelsea fan until their dying day. In recent times Franco has been as fantastic as ever. Last season 2002/03 was a time for a Zola revival. The man trained hard due to being left out of the team a lot the season before. The training paid off. At the end of season 2002/03 Zola had scored 16 goals in all competitions for Chelsea. There were some fabulous goals he scored too. 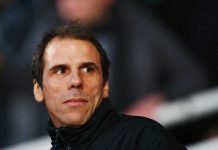 The goals at Manchester City, Blackburn and West Brom in the Premiership were goals that not many players other than Gianfranco Zola could have scored. The home goals against West Ham, Tottenham and Everton were amazing. I remember the game against West Ham at Stamford Bridge when Franco scored the free kick into the top left hand corner. Before he scored I turned to my mate in the lower West Stand and just said watch the top left hand corner of the net. Franco must have heard me, as that was where the ball went. His goals are stunning, his skills are stunning and his balance is stunning. He is Chelsea’s best ever footballer, voted the best and I don’t think there will be anyone ever to match him. 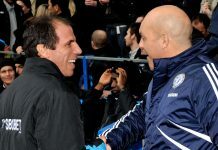 Quite simply Gianfranco Zola is a gentleman, a real gentleman. He will forever be loved by fans of Chelsea Football Club and when the years pass people will talk about legends. In my opinion there is only one legend and that is Gianfranco Zola. I hope he re-news his Chelsea contract for one more season, I wish the man could go on forever, I will never get tired of watching him or listening to him. To sum him up he is fantastic. Now you have retired, Gianfranco, thank-you for everything, from the bottom of my heart I will miss you but I know that you’ll be forever blue.